After many months of promising, the new look TREATNews is here! With funding assistance from the Natural Heritage Trust we have updated the layout and increased the circulation of our newsletter. Our circulation will now extend beyond our membership to include the general public. TREATNews will be available at selected outlets such as local libraries, Shire offices and schools in an attempt to attract broader community support and adoption of TREAT's tree planting ethos.. the right tree, in the right place, for the right reason. This year TREAT's Annual General Meeting will be held on Friday 4 th August at 7.30pm in the Yungaburra Community Hall, Cedar St, Yungaburra. Our guest speaker will be Dave Hilbert from CSIRO and he will discuss vegetation changes on the Tableland. (TREAT brings about vegetation change too, on a small scale!). Important elections for the new management committee will be held. Volunteers will be welcome on subcommittees which run the various aspects of TREAT work. It is hoped that many members will come to the meeting to hear about the progress TREAT is making, to contact friends and to share in decision making. Please make sure you are a financial member so you can vote. A light supper will round off the meeting. Please bring a plate of refreshments. The Co-operative Research Centre for Rainforest Ecology and Management (Rainforest CRC) this year began research into the forest restoration process. Dr. Carla Catterail from Griffith University is leading this program which includes researchers from James Cook University, the University of Queensland as well as QId. Parks and Wildlife Service. Rainforest CRC is seeking your help to build up a complete picture of what occurs when we revegetate areas and to document the process. Many members have been tree planting for years and the results of these efforts can give us pointers on how to improve our efforts and maximise resources. No matter where your plots are located or how big they are, CRC would like to hear from you. Please fill in the attached survey form and return it to. Debra Harrison, Rainforest CRC, James Cook University, PO Box 6811, Cairns QLD 4870. From this information, a range of study sites will be selected which can be examined in greater detail. Please contact the Centre on 4095 3406 if you require further information or assistance. Phew!! Semester one 2000 has been a busy one for TREAT on TAP (Tree Awareness Program). A total of 115 students from Atherton and Feluga (on the coastal lowlands) Primary Schools have been involved. 90 year five students from Atherton and 15 year threes from Feluga participated in classroom sessions, nursery visits and school tree plantings. Some students also attended TREAT plantings at Nasser's and Walter Hill Ranges. Thank you to everyone involved - your efforts are appreciated! Atherton Primary classes learnt about the importance of trees, and compared microbial matter from rainforest and school soils (made possible with the new TREAT on TAP hand-lenses). Thank you to the three teachers, Emma Dickson, Jodie McLellan and Glenys Walker, who continued to work with the students through the TAP booklet. 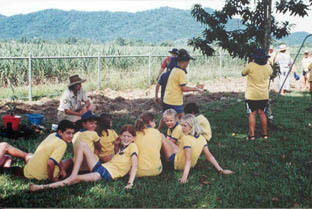 The students planted over 100 trees in their school grounds, with species from the local endangered Type 5b or Mabi forest. Feluga planted an additional butterfly food and nectar garden, which also served as a screen between the school, the road and air-conditioning unit - demonstrating the many values of trees! On our visit with the school this year, the students pointed out recruiting Omalanthus novo-guineesis (bleeding heart) and Macaranga sp. in their planting and gave suggestions on how they might have arrived there. They recognised the bleeding hearts from their visit to the Walter Hill Ranges site on Vince McKeowns property, where they dispersed Cassowary droppings. The students visited C4 and learnt about cassowaries, the flora, fauna and land uses of the area and got their hands dirty potting on. They also went to Clump Mountain Camp and Nature Refuge where they enjoyed a walk, collected cassowary droppings, learnt about indigenous uses for plants, local history and cultural artefacts and how to throw a boomerang. They enjoyed their day immensely. Thankyou to C4, Lenno and staff from Clump Mountain, as well as Anne Stone, Feluga teacher who made our program into an eight week unit. Malanda celebrated World Environment Day on June 5th, along with many countries around the world. 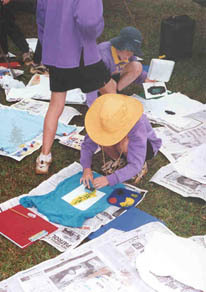 250 school students, local community groups, QPWS, DNR and the general public wandered through interesting displays and program events, including indigenous cultural walks, native wildlife talks, live bats, a water python, bio-banner constructions, t-shirt painting, competitions and educational sessions. Local artist Mark De Groot was commissioned to craft a sculptured bench seat featuring a tree-kangaroo and local saw-shelled turtle to commemorate the day. Visitors to the Environmental Centre can now enjoy a comfy seat to take in the exhibits. This year's theme was 'A Time to Act' and highlighted the importance of the simple ways we can all help improve our environment and the importance of community. To all involved, Well Done! Be ready for something even bigger and better next year! This plant belongs to the family Myristicaceae, which has only 2 genera in Australia. 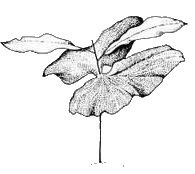 The only species in this genus in Australia is Myristica insipida although another 80 or so species occur in the Asia, Malesia and Pacific Island Regions. Myristica insipida earns its place as a TREAT tree of the month not for its hardiness as a revegetation species on a bare site but rather for other important features. It is a long lived species frequently found in the sub-canopy layer (to around 20m) of many rainforest types in north Queensland from sea level to l000m. It also occurs in southern and central Queensland, Cape York, WA and NT. What makes it qualify as a good revegetation species is its popularity with cassowaries, Victoria's riflebirds, fruit pigeons and musky rat kangaroos. Australian Nutmeg is sensitive to exposed conditions and therefore it needs to be planted or direct seeded into established plots which offer protection. The fruits are very attractive and quite large (30mm x 20mm), occurring singly or in clusters. The outer tan/ mustard coloured capsule can be smooth or velvety and splits open to reveal a single seed exquisitely enveloped in a bright, vivid red networking aril. The cut seed smells distinctly of nutmeg but is a poor substitute for the commonly used nutmeg spice from Asia. The leaves have an attractive contrast between lower and upper surfaces, are simple and 10-20 cm long. Myristica insipida is fruiting well on the coastal lowlands at present. Trees from higher altitudes will mature over the coming months. In March this year, with the approval of the Minister of the Environment & Heritage (Senator Robert Hill), TREAT was entered onto the Commonwealth Government's Register of Environmental Organisations. To achieve this, we had to hold a special General Meeting, modify our Constitution and set up a Public Fund. At the same time that TREAT was entered onto the register, our Public Fund - entitled "TREAT Environmental Benefit Fund", was approved by the Assistant Treasurer (Senator Rod Kemp) as a charitable fund. This means that all donations to the fund over $2 are tax deductible and donations can be claimed by individuals in their tax returns. The Fund is managed by a separate committee which also needed Commonwealth Government approval. This has now been set up with two members drawn from the general public and two from the TREAT Management Committee. Our auditor, Mrs Enid Collins will provide advice to ensure that appropriate standards are maintained as we now have to account to the Government and the public for the way in which we manage the fund. The Fund opened on 9th March and already stands at $1,167. With a steady flow of donations from members and others, we can now look forward to the day when our projects will progressively be funded from our own resources. Replanting the rain forest needs planning with a purpose to get the right tree in the right place for the right reason at the right time. Tropical rainforests contain the greatest number of different plant and animal species (ie. biodiversity) of all types of land use. The Wet Tropics contain the greatest concentration of primitive families of flowering plants in the world and some of the nearest surviving relatives of the ancestors of Australia's present -day native animals and insects. The area of tropical rainforest in Australia has been decreasing for thousands of years, caused mainly by changes in climate but more recently due to human activity. Now all that is left are a few large continuous areas and many smaller isolated patches or remnants. Clearing the rainforest means loss of this biodiversity and of our natural heritage. Remnants may be too small to support many species, or they may be too far apart to allow easy reproduction of some plants, animals and insects. Replanting corridors to connect these remnants or increasing their size can help to restore the biodiversity of the whole area as well as within the remnant. Planting corridors of rainforest along rivers and streams can decrease erosion, leading to better water quality, and provide windbreaks for agricultural activities. Repairing and maintaining existing forest preserves the present ecosystem and provides recreation areas for people. Your success in replanting rainforest species depends on how well you know your natural environment soils, climate, height above sea level, rainfall, land forms and the problems caused by erosion, weeds and loss of fertility. Each environment has a set of species that grow best there and will be most suited to the local soil type, aspect, slope, altitude and drainage. You will need to choose the right species for the right place so get to know your environment before you start. If the area you wish to replant has been degraded by loss of fertile topsoil from erosion, or is naturally infertile fertiliser can help trees off to a good start. Also, you may need to provide structures to prevent further erosion to the site while the trees are small. If the area has been infested by weeds (a weed can include everything from a grass to a tree), you will have to remove or kill them to allow your small trees to become established. If you have grazing animals, they will need to be excluded by fences. The species that make up one type of rainforest in one environment can change from time to time as the forest ages from young forest through to mature forest and old-forest. This change in species within one type of rainforest is called 'plant succession'. If you look at the edge of a rainforest or inside when an old tree falls and dies, you will see plant succession in action. On bare ground or at the edge of the forest, the first species to grow are grasses and broad-leafed, non-woody herbs. These are followed by woody shrubs such as lantana and tobacco bush, which are replaced by small hardy trees known as the pioneer tree species which can grow readily in full sunlight. These pioneer tree species provide the shelter required by the secondary tree species to become established. As the forest matures, many of the pioneer tree species and some secondary tree species are replaced by vines, ferns and other tree species which become established by seed dispersal from nearby rainforest areas. Consider how your replanting efforts will fit within the local and regional landscape. You will need to consider the size, shape, fragmentation and linkages of your site. The ideal shape is as big an area as possible, providing the largest amount of interior habitats and the smallest amount of edge habitats. Corridors of forest provide an avenue for the exchange of existing, and recruitment of new, plant and animal species between fragments of rainforest. TREAT has promoted corridors of forest along existing streams as a method of linking forest remnants, controlling weeds along streams and preventing erosion of stream banks. To successfully replant a rainforest, you wilt need to consider at what stage of the plant succession you wish to start. In this method, one or a few quick -growing species are planted to provide a leafy closed canopy within about 12 to 18 months, shading out weed species and providing a framework under which other species can become established. Typically a mixture of pioneer and secondary succession species are used, which fruit young and attract birds and animals to feed and disperse seeds from nearby rainforests. 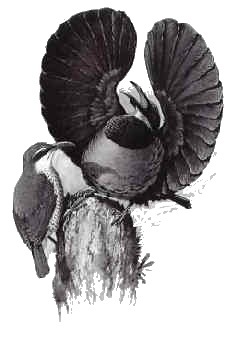 In this method, the bulk of the species are from the mature -age forest in an attempt to recreate the original diversity of species in one go. This method is more successful when the site is small or far removed from other rainforest areas, such as urban locations, council parks, golf courses and rural residential allotments. A disadvantage is the slower growth rate of many mature -forest species which requires greater attention to weed control and other post-planting care. This method is a speeded-up version of natural plant succession. Fire is excluded by firebreaks, grazing animals are controlled by fencing and noxious weed species are removed. Regeneration of the forest then relies on the germination of seeds of native species stored in the soil or spread from nearby rainforest areas. This method is suited to repairing the margins of existing forests or areas close to existing rainforests. How do I achieve my plans? Discuss the whole project with the property owners if you are not the owner, and with the neighbours. Seek advice from local community groups government organisations and technical advisers. Consider the 4 R's - the Right tree in the Right place at the Right time for the Right reason. What are the right species for each environment on my site? Where will I obtain the trees, or should I germinate my own seedlings? When is the right time to plant them? How and who will plant them? Who will do the post-planting maintenance? Who will do the post-planting monitoring of plant and animal recruitment? Map your site, marking soil types, drainage lines, access needs for vehicles and animals, fences and present vegetation. Research the history of your site noting previous floods, previous vegetation and previous land uses. Since the Lake Eacham Nursery was first established with TREAT in 1982, group membership and expertise has grown, along with the activities and services offered by both TREAT and Qld Parks and Wildlife Service (QPWS). In addition to revegetation, the nursery now undertakes significant farm extension work, student training and research work and supports similar initiatives in Australia and overseas. The nursery and its staff are increasingly providing advice on restoration works throughout the QPWS Northern Region, especially Cape York. In response to this changing and increased responsibility, nursery staff prepared a detailed submission on the nursery's future direction, including a change of name. The QPWS Centre for Tropical Restoration has now been decided upon and an expansion of both our buildings and outside area is also in the planning stages. All new and existing members are still welcome to visit and use the facilities and services as they have for the past 18 years and to watch developments at the new Centre for Tropical Restoration! Assistant Manager Tania Murphy recenty gained promotion to a position in Atherton. Congratulations Tania - thankfully though the promotion is only until February next year when Tania will return to her Centre position. In the meantime Peter Dellow has been promoted to Acting Assistant Manager. Well done Peter and good luck! Steve McKenna is also back as a research assistant and will be working on compiling a Restoration Plan for Kearney's Flat in the Goldsborough Valley, corridor mapping and establishing new research sites at Massey Creek and El Arish. Indigenous trainee rangers Syb Bresolin and Warren Canendo recently completed their 12 month traineeship. Syb and Warren were fantastic trainees and are now regarded as highly skilled staff. QPWS Regional Director Clive Cook congratulated both on completion of their traineeships and, in recognition of their skills, both have been retained as employees. They are now developing new training materials for QPWS staff and indigenous communities. Congratulations Syb and Warren on a great effort. A warm welcome is extended to new trainee indigenous rangers, Neil Stanley, Keith Barlow and Curtis Nehow. They are already throwing themselves at their work and we wish them every success. Extensions and modifications to the greenhouse will soon be taking place. This will help to cater for the increased number of members volunteering and the rate of production, and will virtually eliminate lifting and bending during the potting process. All plants are now being produced in recyclable tubes which are much more expensive than plastic bags but more beneficial to the environment. We remind members to please rinse off the surface dirt and return used tubes. The Centre is currently registering for internet connection. TREAT members will soon be able to access the TREAT web site (www.TREAT.net.au) at the Centre and see Simon Burchill's skills. Widespread frosts at the beginning of June did not significantly damage any of our plantings. Strangely, some of the older plants at Petersen Ck suffered minor damage, rather than recently established stock. The Centre would be interested in any feedback about frost damage- was there anything badly affected? Or not affected? TREAT and the Nursery are missing a motorised tree planting/post-hole auger. This item is both expensive and essential to our activities. Presumably it has been borrowed but yet to be returned. If you have inadvertently forgotten to return this piece of equipment could you please drop it back to the nursery as soon as possible. TREAT has been actively improving our local environment for 18 years now. In 1982, it started with only 30 members and has grown steadily since. Membership peaked in 1997 with over 600 members and presently stands at a little over 500. Apart from the obvious benefits, your $10 goes towards supporting a great community driven organisation. It has inspired others from places like PNG, Thailand and Brazil to initiate similar programs. TREAT continues to attract government funding for revegetation projects and-expanding its education program in local schools. Yes, this is a membership plug! Even if you no longer have a need for free trees TREAT needs your support and is a worthwhile organisation to be a part of - keep your membership active!